Hoopty Rides: The Greatest Do-It-Yourself Article Ever - 500 cubic inch Cadillac Engine into a '80 Chevette! 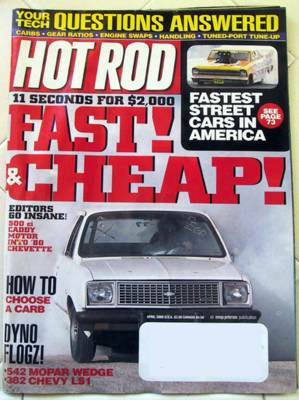 The Greatest Do-It-Yourself Article Ever - 500 cubic inch Cadillac Engine into a '80 Chevette! Recently purchased at a garage sale, probably the best issue of Hot Rod magazine ever published. Fast and Cheap, indeed. Hot Rod magazine is currently editorially adrift, I mean there is an editor, but to what end. They have started to cover the import tuner scene in a perplexing move to broaden their scope beyond the limits of a single magazine. The Hooptyrides racing team is not anti-tuner, not Hot Rod purists but there are already excellent magazines that cover that end of hot rodding. Though not hand holding step-by-step, the greatest article of all time gave adequate detail for a reasonable car person to assemble an 11 second quarter mile, tire burning smoke machine for under $2000. This is Hot Rod magazine - creative, detailed, technical, inexpensive, fast and pure to the core of hot rodding. Swap the smaller volume heads from a junkyard 68-70 Cadillac onto a 71-76 engine and you raise the compression to a staggering 12.0:1. A key to engine swapping is finding the space under the hood for massive engines - especially clearance for the steering as in most cars, the steering tends to hug the motor. They selected the Chevette as all the steering stuff is contained under the front fenders. Smart. I have studied junkyard Chevettes and am searching for oddball sedans (like a Hillman Minx or a Studebaker) to see if I can find similar clearances to build my own tire smoker. This is my second copy of the April 2000 issue of Hot Rod, therefore I am willing to trade it for something interesting. Or, the Chinatown Incubator listens to cash.